Home Arts & Culture Notre-Dame Cathedral on Fire! A huge fire has broken out at Paris’ famous Notre-Dame cathedral and has spread rapidly across the building. The cause of fire was not immediately clear, but officials say that it could be linked to renovation work. 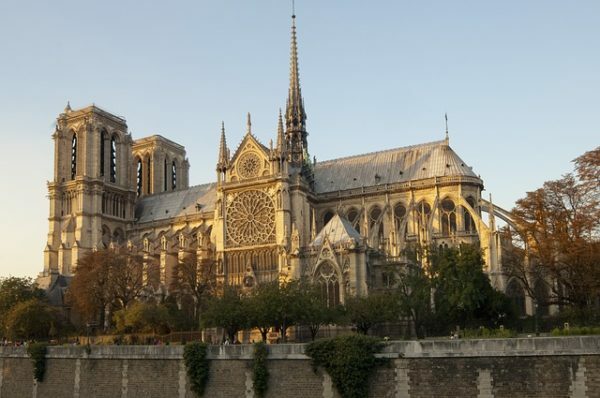 Last year, the Catholic Church in France launched an urgent appeal for funds to save the Notre-Dame Cathedral, which was starting to crumble. A major operation is under way in Paris to tackle the blaze. According to officials, an area surrounding the building in central Paris has been cleared. France’s President Emmanuel Macron has canceled his planned speech to the nation in light of the fire, which has engulfed the giant spire of the cathedral, an Élysée Palace official said. Paris Mayor Anne Hidalgo described it as a “terrible fire” and urged people at the scene to respect the boundaries set up by fire crews in order to ensure that they remain safe. President Donald Trump suggested “perhaps flying water tankers” could be used to extinguish the fire.